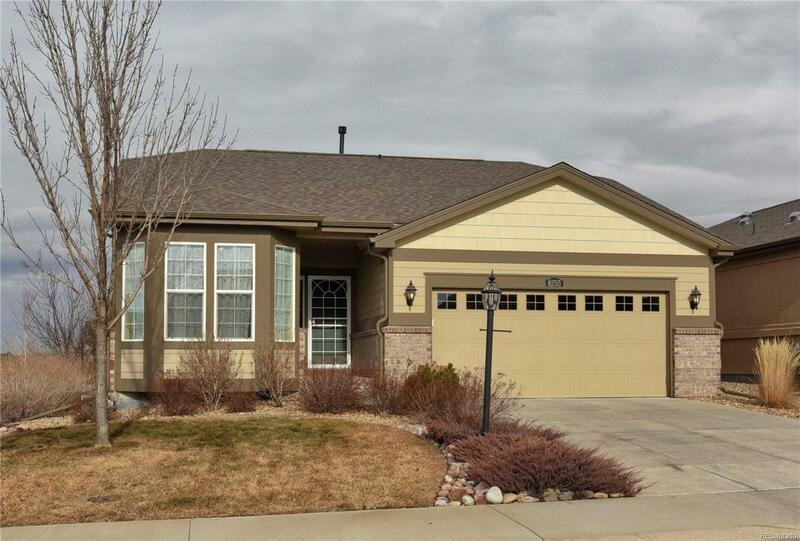 Wonderful ranch home on corner lot in the beautiful & sought-after 55+ golf community of Heritage Todd Creek! The open floor plan features a sunny eat-in kitchen at entry with wood floors, breakfast nook, dark cabinets, double oven, stainless steel appliances, pantry, & granite counters with pass-through window to the formal & vaulted dining room. The vaulted family room with ceiling fan & gas fireplace provides access to the covered patio in the fully landscaped yard with sprinkler system to enjoy the beautiful Colorado weather. Two secondary bedrooms with ceiling fans, a full bath, laundry room, & vaulted master bedroom with ceiling fan, walk-in closet, & private 3/4 bath with large double vanity & glass shower complete the home. This great community includes walking trails, clubhouse, tennis courts, pool, luxurious 700 acre 18 hole golf course, & is located close to Orchard Shopping Center, new Denver Premium Outlets, dining, & major highways making for quick & easy commutes!